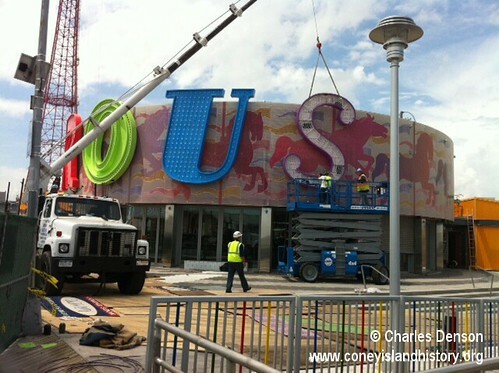 The large-scale neon letters spelling B & B CAROUSELL with a double L, of course, went up on the historic ride’s new pavilion on the Boardwalk today. Charles Denson of the Coney Island History Project happened to be there to take this spectacular series of photographs. 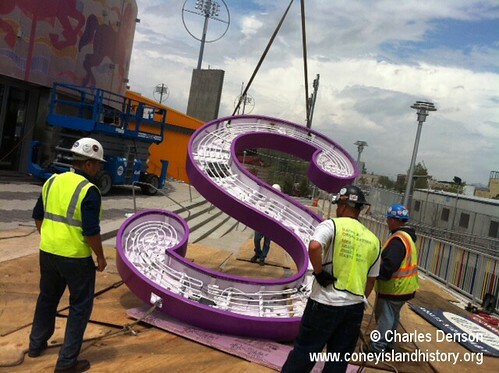 On Friday morning, the grand opening of Steeplechase Plaza and the return of the 1919 carousel to Coney Island will be celebrated by Mayor Bloomberg and other elected officials, local residents and invited guests. The carousel was saved from the auction block in 2005, when the Mayor came to Coney Island for a hastily arranged press conference to announce the City would purchase the ride for $1.8 million. 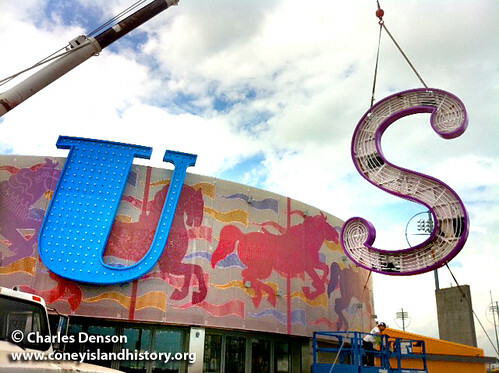 “Dozens of carousels have left Coney Island forever but the B&B Carousell is the only one to actually leave and come back,” said Denson, when the first restored horse was exhibited last May at the Coney Island History Project. B&B is short for Bishoff and Brienstein, who brought the carousel back home to Coney Island from New Jersey’s Bertrand Island in 1932. The frame was the work of Coney’s William F. Mangels Carousell Works and the carvings were done by Charles Carmel except for the lead horse by M.C. Illions. Jimmy McCullough and Mike Saltzstein owned and operated the ride since the 1970s. Welcome home to the B&B! Yes, I know why they spell it with two, just wanted to kid them. I’m sure some kids will be asking their parents why it’s spelled with two L’s! The colors on the letters are very cheerful. But they’re not aligned especially well. on May 24, 2013 at 11:41 am | Reply C.
So, why are there two L’s? The frame was the work of Coney’s William F. Mangels Carousell Works. Mangels spelled it with two L’s and it stuck! The carousell was restored beautifully – it is great to have it back. The rings are absent – it was explained that this was due to safety & insurance reasons. No one seems to notice, but the letter signs amount to a H U G E oversight. (Not the extra “L” which some of you have jumped on without historical awareness.) No one is able to see the entire word CAROUSELL at any position. I hope someone responsible for that can at least arrange a special photo call from helicopter if that is the only way to get it – but with the curve I’m not sure even that would be possible. What a bunch of idiots! Let’s ride the CARO while you ride the USELL. This will look fantastic at night when it is all lit up. I am assuming the whole thing rotates so that you can view it all from one spot.